Lucky clouds circle its base and lid opening, framing the Yin Yang symbol of a changing and balance-seeking universe. Hong Ni (red yixing) and Zi Ni (purple yixing) clay are used together in this detailed yixing clay pot. This pot is good for any type of tea, especially black and puer tea. This pot holds 300 ml of liquid and is one of our medium size, thicker walled pots, made by pottery master “Zhu Ming Jun. According to Chinese medicine, tea is a type of herbal that is safe to consume daily to give you good balance and health for your body. The yin and yang symbols are carved on the top and port of the body. It is easy to see how skilled the master is, taking time to carve Chinese lucky clouds on the base and lid opening, framing the Yin Yang symbol of a changing and balance seeking universe, drawing from the traditional Daoist motifs in its design. The design of this pot is a classical round shape, giving your tea room to move and open inside. 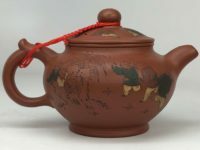 The main color of the pot is red with the handle, spout, and decorations are purple clay. The master took time to design the lid to seal the pot very tightly. Yang is the red color on the lid, you will notice there is a hole on the lid, this allows you to lift the lid once there is tea inside. This pot can be enjoyed as a piece of art as you brew your tea, giving you a peaceful and balanced feeling. We wish you can enjoy and infuse wonderful flavor from good quality tea in the pot, along with the accompaniment of good wishes. Learn how to brew tea in a yixing clay pot.